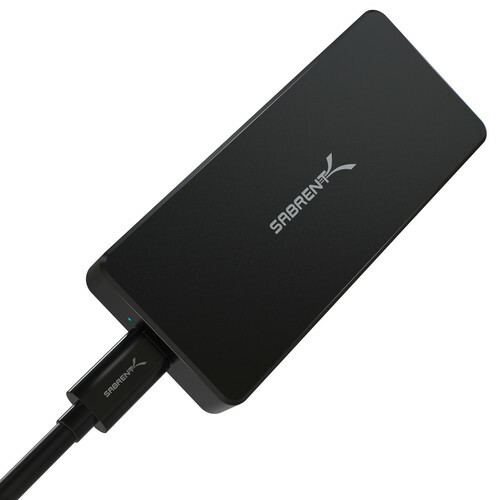 The black Rocket Pro NVMe USB 3.1 External Aluminum SSD from Sabrent is designed to be compatible with computing systems that house an NVMe PCIe M.2 interface with a form factor of 2280 (80mm), which allows you to store your data safely. This 2TB solid-state drive is made from durable aluminum and delivers support for flash disk and USB 3.1 Gen 2 technology. Moreover, the Rocket Pro has a single 10 Gb/s USB 3.1 Gen 2 Type-C port and can deliver read speeds of up to 3450 MB/s and write speeds of up to 3000 MB/s.